Cad Bane, Embo and a group of other distinguished Bounty Hunters have to survive the harsh environs of The Box, from THE CLONES WARS Season Four, out now on UK Blu-ray and DVD. Our countdown to AFICIONADO's personal top five favourite episodes of THE CLONE WARS Season Four continues- co-inciding with its exclusive release on Blu-ray and DVD this week (full to the brim with special features, too!). Reaching position number three, there were plenty of episodes near the hallowed top spot to consider, including Darth Maul season finale Revenge and Zygerian action fest Escape from Kadavo, but it was the exciting and diverse alien-packed adventure, the third part of the Obi-Wan-in-disguise plot, that won the day: clever, exciting and a fast paced visual triumph, it has to be The Box. 1. The Box. A triumph of simple design (in fact, very Borg-like from STAR TREK: THE NEXT GENERATION, if not a spaceship) and apparently not easy for the animators to realise, Count Dooku's huge structure/lethal killing jar will truly sort out the men from the boys, or rather the Bounty Hunters from the wannabes: its immense, multi-layered, death efficient vault areas containing the most diabolically lethal traps and weapons, all of which had to be carefully planned/choreographed and staged behind the scenes by Dave Filoni and director Kyle Dunlevy. A true place of nightmares and a real test of courage, ingenuity and luck, of which only the most resourceful and skilled will escape to make Count Dooku's lethal assault force against Supreme Chancellor Palpatine on Naboo. 2. The Bounty Hunters. We had six of 'em on the bridge of the Star Destroyer Executor in EMPIRE, and we had the likable posse that joined forces with Anakin, Obi-Wan and Ahsoka to fight against Hondo Ohnaka's mercenary hordes in THE CLONE WARS episode Bounty Hunters, but The Box had to have the most of their kind yet assembled in any STAR WARS adventure, 13 no less, all weird and wonderfully realised, from the classic Cad Bane and the equally cool hatted fan favourite Embo (who also got a bit more to say this time around), to the finally made it to the screen Ron Cobb creation of the octopus-like Parwan, plus some Classic Trilogy Hammerheads and a Snaggletooth. Along with the episode's clever production designs, the creatures talents and abilities were well thought out and they came across as a fine team working together against the dangerous scenarios playing out around them. It's a shame that so many of them have to be killed off by episode's end. 3. Cad Bane. That hatted killer for hire from Duros has some great scenes in this episode. Newly escaped from prison life on Coruscant with the aide of snidey Moralo Eval and a disguised Obi-Wan Kenobi, his place in the pantheon of great STAR WARS villains is well and truly assured, not just in this episode but the ones that bookend this particular four-part storyline, proving cruel, cunning and full of surprises. I loved the moment in The Box where he killed one of the Hammerhead bounty hunters in order to finally get his beloved old hat back! 4. Obi-Wan undercover. 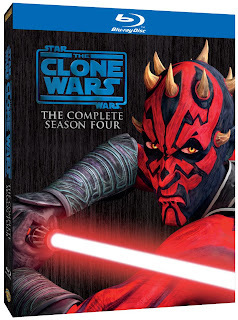 Filoni and the gang, alongside vocal star James Arnold Taylor, get to flex their dramatic muscles considerably and provide some new surprises to viewers with this four-part adventure, as, to stop the imminent attack on Palpatine, Kenobi effectively gets himself "killed" in order to become a new man, bounty hunter Rako Hardeen, so as to infiltrate Count Doou's plan. As the escaped prisoner, alongside other jailbirds Moralo Eval and Cad Bane, he looks totally different thanks to his new bald head, voice synthesizer and huge tattoo markings, but Kenobi's inherent good heart as a Jedi and his incredible powers in the Force show through and come in very handy as he makes his way into Count Dooku's final squad. Though on the bad side, such skills and abilities conjure up subtle warnings to the Sith Lord as his plans near completion. 5. The Ralph McQuarrie influence. Obi-Wan gets to wear some cool bounty hunter gear, most notably a helmet that's a fine tribute to the legacy of the late, great artist and his early designs for a STAR WARS II super soldier Stormtrooper/ Boba Fett. Such choice creative revisitation decisions from the show's modern behind the scenes team ramp-up THE CLONE WARS respectability with fans/critics even more. I agree, one of the better episodes of the season. Not sure if it would make my Top 5 if the "Carnage of Krell" story is counted as four deference episode, not one story. I thought the inside of the Box kind of reminded me of the Portal video games. CLASSIC INDY: ADVENTURE BY JONES, ART BY STRUZAN! CLASSIC ART: MAN, MACHINE AND MONSTER! CLASSIC IMAGE: GOODBYE TO THE FALCON? AOTC AT TEN: FAMILY VILLAINY! BEHIND THE SCENES: A JEDI HOLDS FIRM! DELETED SCENE: BIRTH OF THE REBELLION! BEHIND THE SCENES: DEVIL WAMPA! BEHIND THE SCENES: JAR JAR'S SPOTLIGHT! BEHIND THE SCENES: THE CHASM! CLASSIC ART: BALANCING THE FORCE..
BLU-RAY FORTUNE AND GLORY WITH INDIANA JONES! CLASSIC IMAGE: THE RETURN OF HOT-LIPS! BEHIND THE SCENES: X-CLUSIVE X-WING!